Since I finished Esther Kinsky’s magnificent novel River, it has been difficult for me to contain my enthusiasm for this work, and yet, with a major review on the way, I wanted to refrain from talking at length about my reading of this languid, mesmerizing meditation on the relationships we have with place—those we live in, pass through, or linger in uncertainly during points of transition. That review is now live, and yet Kinsky’s book is still working its way through my system. River is a slow read; immersive, poetic, attentive to detail. It creates an atmosphere of intimacy with the spaces the unnamed narrator traverses during a time of restless displacement in a community on the edge of London; a time of gathering and preparation for leaving the city where she has lived for a number of years. Some of these spaces are immediate, defined by the course of the river Lea. Others exist in the distance, temporally and physically. And yet, although there are clear parallels between Kinsky’s own life history and the locations her narrator visits, River occupies an intentionally indistinct borderland between fiction and memoir, focusing on experience in the moment over biographical background and detail, resulting in a narrative that flows, organically, like the rivers than run through it. My review of River can be found at the online site of the singular journal Music& Literature. The opening passages are reproduced below, you can read the rest of it here. 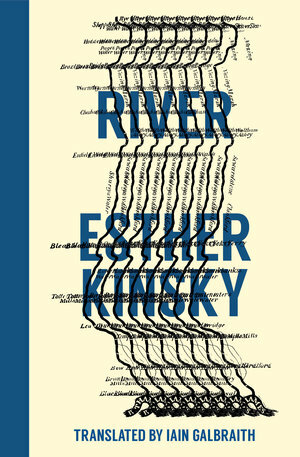 River by Esther Kinsky is translated from the German by Iain Galbraith and published by Fitzcarraldo Editions in the UK and Transit Books in North America. Next Next post: The never-ending ending: When will this move be over?